Hey Friends! This is a very special edition of What’s in my Fridge because it is an answer to one of my most favorite YouTubers challenges! See below video and the rest of this post will make so much more sense! Also, you should 100% subscribe and follow Babish on all channels, his stuff is amazing! This was a huge shot of inspiration for me last night! I was exhausted from work yesterday and after seeing this challenge was actually inspired to get up and create what turned out to be an awesome dinner! I will say that this wasn’t the hardest What’s in my Fridge challenge as far as ingredients to work with because I actually went food shopping this week. The challenge came in creating an edible version of the Car Panini from Family Guy! Then I went to the fridge to compare. I had some left over spicy chorizo sausages, I always have peanut butter, I had chocolate chips, baking chocolate and cocoa powder first three ingredients down! For the cheese I pulled out my shredder cheddar and goat cheese. Looking at everything only one thing stood out to me, HOLY MOLY I have to make MOLE! I have never made mole sauce and haven’t eaten it much either but after a quick google search found out that you can make a really quick and simple mole with chocolate and peanut butter! Two of the hardest ingredients done! Everything else came together from there I figure a goat cheese cream would cool down the spicy sausage and mole and I could just melt the cheddar into little crisps to add another layer to the panini. Y’all it actually turned out quite tasty, I am happy to share the recipe below & in true Binging with Babish fashion, share my awkward food eating video. To a dry small sauce pan add the spices (chili, garlic, cumin & cinnamon) turn the heat to medium high and toast just until fragrant, about 30 seconds. Add in hot beef stock and tomato paste. Whisk until combined simmer for 1 – 2 minutes. Add in peanut butter cocoa powder and chocolate chips, whisk until melted and smooth, turn heat down to a simmer. Add water as needed to thin to your desired thickness. Simmer for 10 minutes stirring occasionally. Pre-heat oven to 425. Place a small handful of cheddar cheese in six piles on a cookie sheet lined with a silicon mat or parchment paper. Sprinkle just a touch of cayenne pepper on the rounds. Bake the cheese from apprx 5 minutes checking constantly just until all cheese is melted and edges begin to brown. Remove from oven and let cool slightly. Transfer crisps to paper towels to drain excess grease, crisps with get crispy as they sit out of the oven. Once cooled, trim to desired shape! I took half a log of regular goat cheese (about 4 ounces), a splash of milk, about a teaspoon of honey, lots of salt and probably close to 1/4 cup of lime juice and whipped it all together with my hand mixer until it was the consistency that I wanted. I continued to alternately add milk and lime juice to make it into a thick but runny cream. On a thick piece of bread slather some mole, add your cooked chorizo sausages and another layer of mole, trim your cheese crisps into triangles and place them a top of the sausage, top cheese crisps with goat cheese cream & top with bread. Butter both sides of bread and place into your panini press/george foreman. Server with your favorite Mexican beer and be sure to tell your friends “This is NACHO panini, you gotta get your own!” before letting that panini join the clean plate club! Welcome to 1931, the George Washington Bridge connecting New York & New Jersey has just opened, a loaf of bread is 8 cents, The Star Spangled Banner has been officially adopted as our national anthem, and Dracula and Frankenstein are premiering in movie theaters across America! At home food is the foundation for healthy living and you’d better believe mom is the one cooking it. I chose to use the Pictorial Review Standard Cook Book : A Sure Guide for Every Bride, as our first cookbook of month because I love exploring vintage recipes! Also, this book is very special to me because it has the family favorite raisin sauce for Easter Ham! My mom gifted me this book as one of my wedding gifts and I am going to treasure it for a long time! While sifting through some recipes that I wanted to cover this month I uncovered items that frankly scare me, jellied chicken, ham mousse, roast squirrel, I may be getting myself in too deep with this one… but how fun is it going to be to explore these culinary creations of years past! I cannot imagine the mass public eating these types of meals daily and I would love to go back in time just to spend a week eating meals with American families. Since I have not yet invented time travel it will be up to me to recreate some of the more intriguing, yet still palatable, recipes of yesteryear! If the following plan for making menus is used the essential nutritive elements, in amounts adequate for the normal individual, will be provided. Use a pint of milk a day for every adult in the family, a quart for each child. Serve two vegetables other than potato every day, one of them a raw or leafy vegetable as often as possible. Serve at least one fruit, preferably two, every day. Use fresh, raw fruit frequently. Allow a moderate serving of meat or fish and egg daily. Use fat in moderate amounts. Serve enough starchy food and simple sweets to satisfy the appetite after the other requirements have been met. With those guidelines now set, let us explore our first dinner! Prepare yourselves for a bunch of molded food. I seriously have no idea what got into people in the 30’s – 50’s but molded food was mod. *Sidenote* I am playing with my whole video set-up so I don’t have in progress pictures of these recipes, hopefully we will have a video at some point! Let me tell you about this noodle ring . . . it definitely left something to be desired in terms of taste. . . and looks . . . and texture . . . and yanno, it kinda grows on you . . . no, not really, probably don’t make this one at home. Roast chicken is always a tasty a delicious Sunday dinner, so let’s start with that part first! Stuff and dress the chicken and place on its back in a roasting pan. Sprinkle with flour or rub with a paste of fat and flour. The latter treatment will make the skin especially crisp and delicious. Put into a very hot oven (500). After fifteen or twenty minutes, when the skin is well seared, reduce the temperature to 375 and put the cover on the roaster or add half a cup of water to the pan. Cook until tender, basting often with the liquid if an open container is used. Allow twenty to twenty-five minutes to the pound. Rinse and pat your bird dry, never throw away the giblets people, save them for your gravy later. Stuff your bird with aromatics, onion, celery, carrots, garlic salt & pepper. A sprig of rosemary or thyme if you have it. Take softened butter and smear it between the breast meat and the skin. Yup, stick your fingers up under the skin of that bird and make a little pocket for more butter than you think is necessary. There is no better way to get crispy gorgeous brown skin and moist delicate white meat. Season the top of your bird with your desired flavors, always salt & pepper at the least. Oh Mama! That is a crispy bird! Now onto the molded beast. I had not even heard of noodle rings until I found the recipe in this book, I did a quick google search to make sure I had the concept correct and I am actually pleased that it stayed molded once out of the oven and baking dish. I am not pleased with the taste and texture, I can however see how it might work with some tweaks. Maybe I will revisit it down the line but for now i’ll just drop the recipe here and move on. Cook the noodles in boiling salted water until tender and then drain. Mic the flour to a smooth paste with a little of the milk. Add the rest of the milk and cook untl thickened, stirring constantly. Add beaten eggs and seasonings. Combine with the noodles and turn into a greased ring mold. Set the mold in a pan of hot water and bake in a moderate oven. Turn out on to a serving dish and fill the center with creamed fish or meats. Time in baking 40 minutes. Temperature 350 serves 10. I may try to slice it thinly an pan fry the slices, maybe pan frying congealed Ramen noodles in ALL the butter will make them a tasty treat again. Bookmarking this recipe for the next time I need to make a life like brain sculpture though! Hope you enjoyed this week’s adventure into 1930 cuisine, until next time! I have worked 15 consecutive days in the past two weeks, 70 hours in the past week alone, and I still have two days to go before an actual day off. All of this to say that I have not had a single moment to run by the grocery store and do some solid shopping. This means that I am out of lunch meat, milk, eggs, bread, fresh vegetables and fresh fruit. I am ashamed to say that my husband and I have mostly been grabbing meals on the go this week which, as it turns out, does not do wonders for our wallets or diets. Regardless, after I got home from work today I had a huge craving for some home cooking! Somehow I mustered up some energy (must have been from my late afternoon iced coffee), rose from the couch and made my way to the fridge. I opened the fridge, quickly shut it before I became too uninspired, and checked in the freezer. While staring at my packed freezer of mystery meats and vegetables I grabbed a freeze pop, sugar helps me think, I noticed some frozen biscuits on the freezer door. 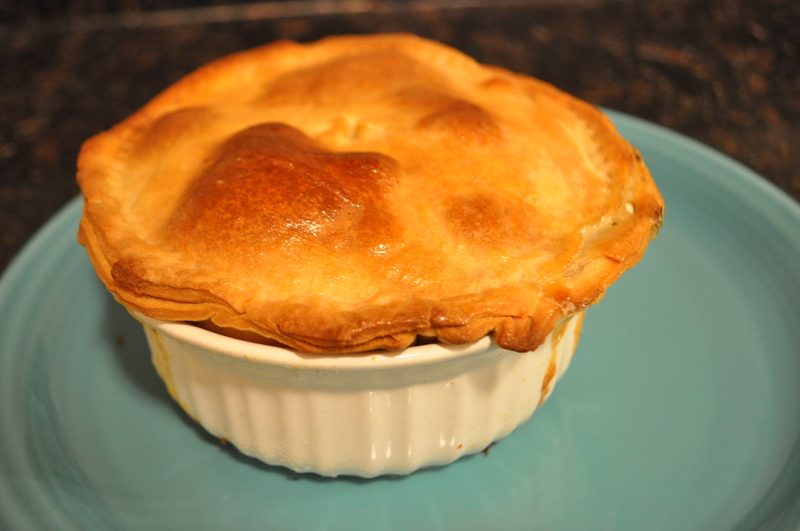 This got me thinking about a recipe I remembered about quick biscuit topped chicken pot pies. Then I remembered the extra pie crust I had in the fridge from when I made Chocolate Chess Pie! 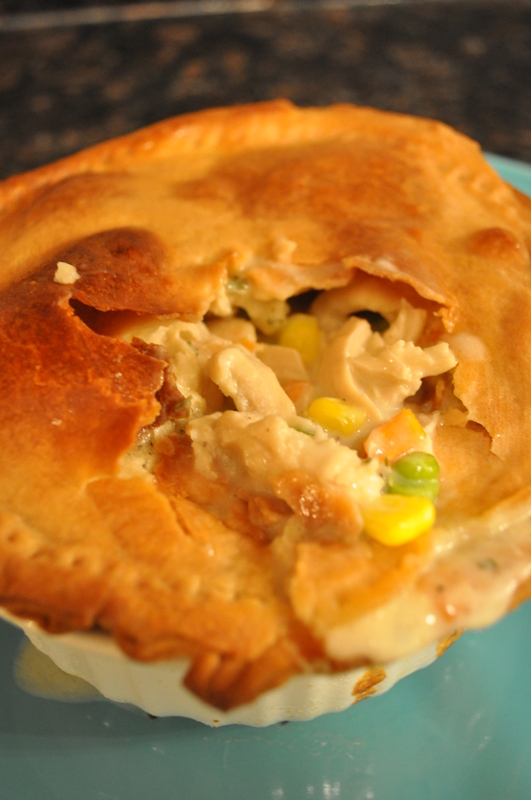 I quickly Googled recipes for Chicken Pot Pie and choose the Pillsbury Classic Chicken Pot Pie. This one has simple ingredients and great cooking temps and times. The items I didn’t have were: milk, and onions. I replaced the milk with heavy cream and just left out the onion. My improvised recipe is below, something to note, I was only cooking for myself and I only had enough left over pie crust to fill one 16 ounce ramekin. This was a large meal for one person and could easily have been split if I had 2 – 8 ounce baking dishes. Pie crust, either homemade or store bought from refridgerator section. I have a small baseball sized ball left over. Pre-heat oven to 425 & butter your baking dish, for me it was a 16 oz ramekin. In a medium saucepan cover frozen chicken tenderloins with water a place on medium high heat. Boil chicken until just cooked through. Remove and shred chicken, set aside. While you are waiting for chicken to cook through place frozen vegetables in a bowl covered with hot water from your tap, they will defrost by the time you need them. This is also a good time to roll out your pie crust and set the crust into your baking dish, making sure to get rid of any air bubbles under the crust. For now leave the over hang. 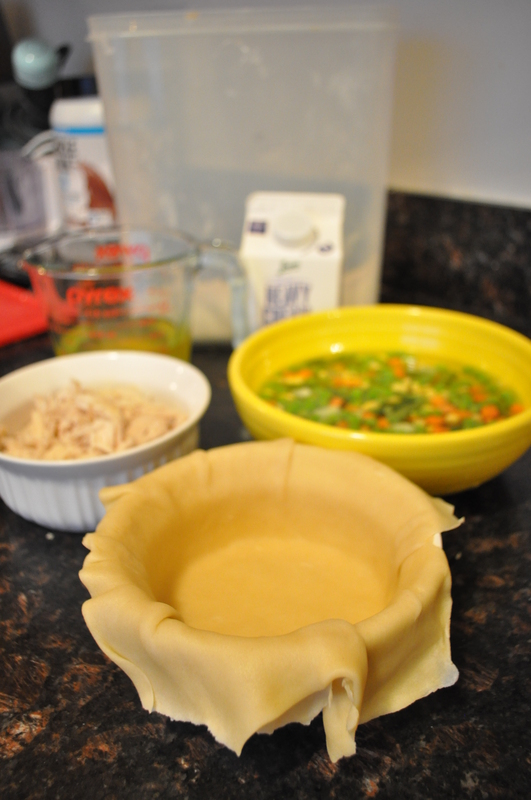 After your pie crust is ready, your chicken has cooked and vegetables are thawed it is time to assemble the filling. In a medium frying pan melt 2 tablespoons of butter add any seasonings here. Once butter has melted add in flour and whisk, you should create something that looks like a paste. Constatly whisk cooking through flour for 1-2 minutes being careful not to burn it. Lower temp to medium and slowly add in 1 cup of stock. 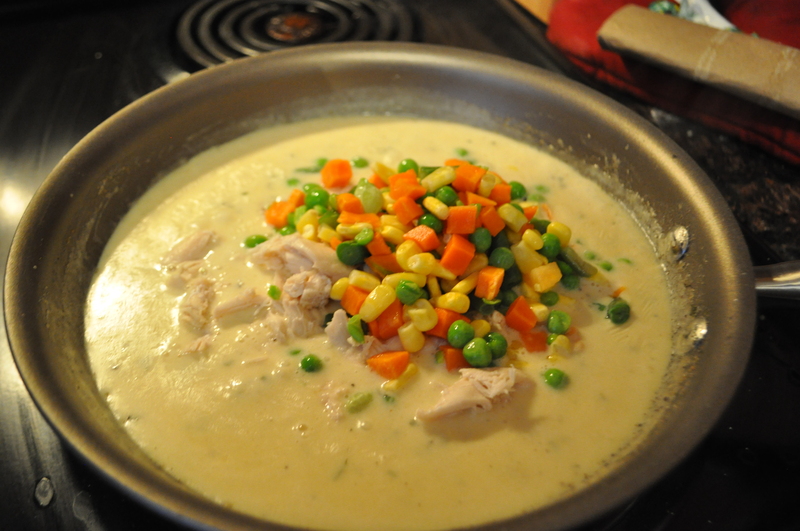 Whisk to create a thick and smooth sauce, add in heavy cream and let simmer to 1-2 minutes. Add shredded chicken and drained vegetables, stir to combine and kill the heat. *IMPORTANT* Taste your filling here, add in any extra splashes of hot sauce or dashes of salt and pepper. Not much is going to change between now and when it comes out of the oven so make sure you like it before you ruin a perfectly good pie crust! Transfer to filling to your baking dish, I actually ended up with about 3/4 cup of extra sauce at this point, but all of my chicken and vegetable ended up in the dish. Did I mention this was a hearty meal? Cover your pie with it’s top crust, pinch together the edges, crimping with a fork or folding however your heart desires. 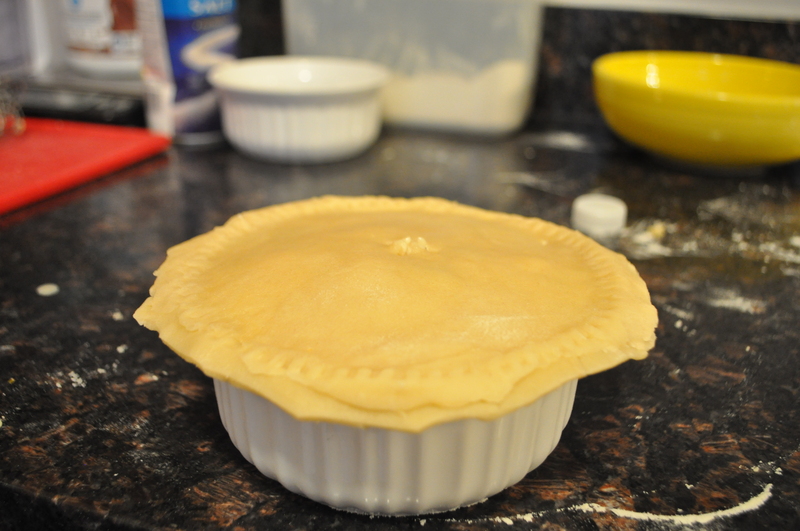 Cut an X, slits, or other design to allow the pie to release steam and transfer your pie into the oven. Cook for 30-40 minutes until the top is golden brown. I like to brush on some honey on the top crust in the last few minutes of baking just to add a little sweetness and give it a gorgeous color. Let your pie sit for 5 minutes and don’t burn your mouth when you dig in! How do you think this Fridge Challenge went? In my book it is Fridge = 0 Joanna = 1. I was starving, bored and home alone, a classic beginning to the first kitchen nightmare I can remember. As a fiercely independent fifth grader I strode into the kitchen looking for a quick snack to satiate my hunger. I ignored the dishes in the sink, noting to myself that I would have plenty of time to clean the kitchen later, and before my parents came home to complain about my slovenliness. I continued into the cabinets, pantry and fridge rummaging for a quick fix meal to hold me over to dinner. Finally, I laid my eyes on the Holy Grail of snacks. . . Instant Ramen. I quickly grabbed a small saucepan, filled it with water, set it on the stove and turned the burner on to high. As I stared at the pot on the stove I thought about my favorite ways to prepare Instant Ramen. Should I drain it completely, toss the noodles in tablespoons of butter, while sprinkling the flavor packet heavily over the noodles? Or should I instead, drain only half the water, dump the flavor packet in the water and eat it directly from the pot? Or should I . . . at this point my brain had wandered and since I was an eleven year old who was weak from hunger, I most likely made my way over to the couch to sit while I waiting for my water to boil. At this point I cannot say for certain what I did, however I am failry sure I again became bored and decided to go pester my older sister. I distracted myself from my hunger and managed to completely forget about the glorious Ramen I should have soon been consuming. After a while I wondered back into the kitchen, most likely looking again for a snack, as soon as I spotted the pot on the stove it all came rushing back to me. I quickly inspected the now smoking pot and noticed that there was no water to be found. I panicked and threw the pot into the sink to fill it with cool water. A huge cloud of steam rose from the sink and after much spitting and hissing the pot calmed. I took a look around the kitchen made note that there was no evidence of my error found a ready to eat snack and continued on with my day. Hours later my mom came home. As soon as she entered the kitchen I was beckoned. Shoot! I had forgotten to clean the dishes in the sink. I ran into the kitchen expecting to be lectured on my laziness, but was quickly corrected. As I entered the kitchen my mom was holding my Ramen pot from earlier, however the pot had a bit of a new appearance. When I placed the pot in the sink, I had inadvertently placed it on top of our plastic cutting board. The pot had melted into the plastic cutting board and was now forever stuck to the white plastic base. My mother was not pleased, I thought it was one of the coolest science projects I had ever attempted. That day I learned the importance of staying aware in the kitchen. I also learned not to panic! I would have saved us a pot and cutting board had I just turned off the stove-top and let the pot cool on its own. To this day I never leave my cutting boards in the sink and almost always use my electric kettle for boiling water. Ugh! Another food blog, I know but this blog isn’t for you. It is a challenge for me, and also a place where friends, family and strangers can lurk… who knows you might find something entertaining! I have a problem, I hoard cookbooks. I have dozens of them in my small apartment kitchen. I have picture after picture on my phone of the titles I want to buy next. I frequently go into Barnes & Noble just to salivate over the cookbook section. I HAVE A PROBLEM. This blog is my solution! It isn’t like I don’t use my cookbooks, I just read them like novels. Tearing through the pages I try to catalog the recipes into my memory by ingredient, hoping that I will remember an inspiring idea the next time I go food shopping. So the idea here is to cook through my collection of books! Why make it public? Accountability! I have at least one friend *cough, cough Marisa** who has begged me to make a cooking blog. I post a lot of tasty dinners on social media and my friends always seem to be amazed by my culinary abilities. If I don’t make it public and shame myself for not posting new content, I will never cook my way through my cookbooks. So what is the content going to be…exactly? I’ve decided to break it down in 3 categories. Cookbook Corner – I will choose a cookbook of the month and post recipes from my cookbook collection. This may involve step by step videos of real-time cooking! Kitchen Disasters – I’d like to collect stories of kitchen failures from friends and family, it is always encouraging to read hilarious stories of how everyone fails in the kitchen. Fridge Challenge – AKA “I think I’ll just order pizza, oh wait payday isn’t until next week.” This is the classic home cooked version of Chopped. How to create a gourmet meal out of a can of tuna and some hot sauce packets! So whether you are my family and friends (love you) or just a random internet stranger welcome! I hope you enjoy The Cookbook Corner for what it is!